Experience our tasty Waffle French Toast with Maple Cream. Break out the waffle iron and some challah bread for this Waffle French Toast with Maple Cream. Whisk eggs, milk and 1/4 cup syrup in pie plate until blended. Spray waffle iron with cooking spray. Dip 1 bread slice in egg mixture, turning to evenly moisten both sides of bread. Shake gently over pie plate to allow excess egg mixture to drip off. Add bread to hot waffle iron; close lid, gently pressing on lid handle to flatten bread slightly. Cook 3 to 4 min. or until golden brown. Repeat with remaining bread slices. 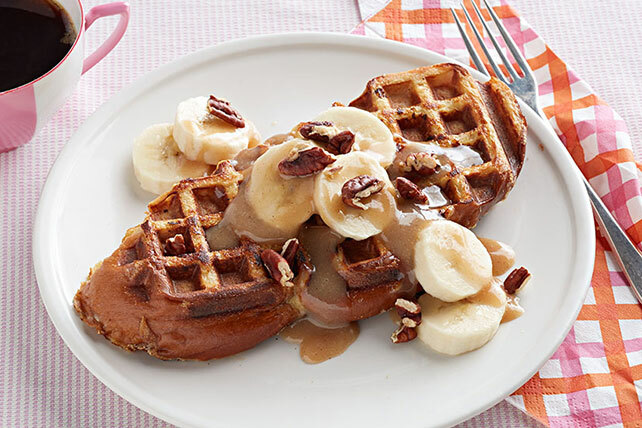 Slice bananas; spoon over waffles. Top with cream cheese sauce and nuts. For best results, trim the bread slices to fit your waffle iron before using to prepare sandwiches. If your waffle iron is large enough to fit 2 bread slices, then you can prepare and cook this French toast in batches of 2 bread slices each. If you don't have a waffle iron, then you can cook the dipped bread slices in a nonstick skillet, or skillet sprayed with cooking spray, on medium heat 3 min. on each side or until golden brown on both sides. Serve with freshly brewed MAXWELL HOUSE Coffee. To keep the cooked French toast slices warm until all are prepared, place in single layer on rimmed baking sheet in 200ºF oven until ready to serve.